Lanzarote Beach Villas offer a range of well maintained self-catering accommodation in two prime locations at the southern tip of the island. We specialise in self catering villa accommodation in Lanzarote and over the last few years we have purchased a number of Lanzarote luxury apartments and villas which we have made available for hire. All of our apartments and villas in Lanzarote are completely modernised and feature fully fitted bathrooms and kitchens with all the appliances and comforts you would expect to find such as washing machines, refrigerators and satellite television. 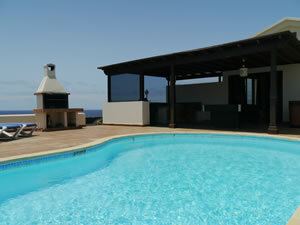 If you are looking for affordable villa accommodation in Lanzarote with a sea view then you will be delighted by the Playa Flamingo properties which are featured on our website as they are all just a few metres away from the beach and are ideal Lanzarote accommodation for anyone planning a short break or holiday. As well as being able to provide cheap accommodation in Lanzarote we also have a number of luxury villas which are available in the Faro Park region. These are perhaps the ultimate in Lanzarote accommodation and they feature private terraces, heated swimming pools and large bedrooms with en-suite bathrooms. Faro Park. With stunning coastal views and the back drop of Mount Roja, Faro Park is the destination for those seeking luxury accommodation combined with peace and tranquility. Our architect designed villas offer the highest possible standards of accommodation and are only a short drive away from the resort of Playa Blanca. For convenience there is a small supermarket, bar and two restaurants. Both villas have three bedrooms and feature their own private heated swimming pools, large terraces, satellite television and much more. Playa Flamingo. Two bedroomed villa situated only a few meters from the private sandy beach, with its own sheltered swimming area for safe bathing. The well kept resort features a range of supermarkets, restaurants and bars as well as two good sized swimming pools, making it ideal for the family. For the more adventurous SCUBA diving, tennis courts and sea fishing are also available. 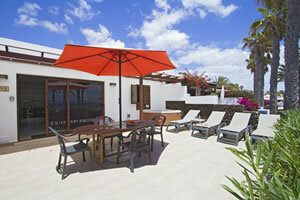 A short walk along the coastal promenade, with its stunning views, brings you to Playa Blanca. This small fishing town offers a wide range of shops, restaurants and bars together with a doctors surgery, pharmacy, car and cycle hire. Regular ferries to near by Fuerteventura run from the bustling harbour.